How do I motivate my customers to identify themselves at the point of sale, even if they "just look" and inform themselves? Many retailers face this challenge when they try to get one step closer to the Omnichannel vision. Omnichannel often fails because of the link between online and offline shops. While a large number of data-based interactions with customers are possible in e-commerce, customers in stationary stores cannot be identified and therefore cannot or only to a limited extent be linked to online profiles. On the other hand, retailers often do not know which products are available at the store or are unable to pass this information on to customers. Additional product information about mobile devices and mobile payment methods is a way to motivate customers to identify themselves in a store with their mobile device and thus with their profile. The problem of many dealer applications is the lack of customer use, as added value is not directly apparent: Why download another app from a retailer and register there just to get information or offers that can be researched differently? 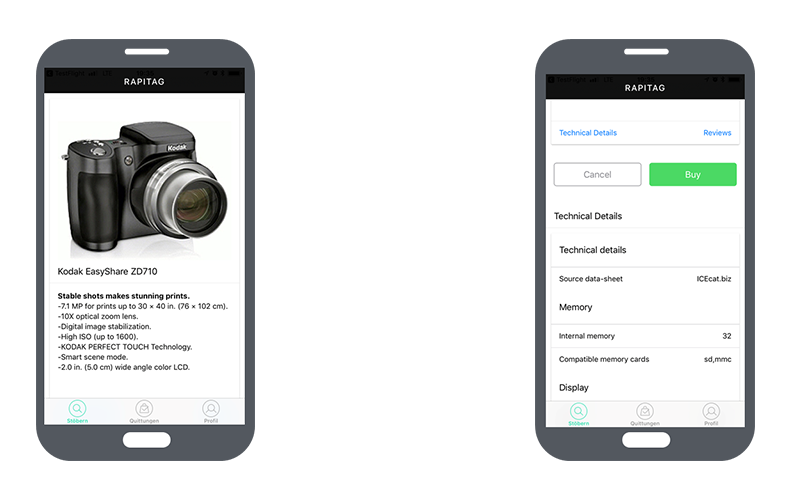 Rapitag has developed an innovative anti-theft device that customers can open and remove independently with their smartphones as soon as they have paid for the product on the move. At the same time, the user can identify the product and view additional product information such as pictures, videos or reviews. This interaction naturally requires systems from which data is provided and in which the information gained about the customer can also be collected and used again. Together with rapitag, Syskoplan Reply has created an interface to SAP Hybris Commerce, the omnichannel solution in the SAP portfolio. Comparable to e-commerce, this combination makes it possible for the first time to collect customer behavior locally in the store and to offer self-check-our services. Hybris Product Content Management (PCM) contains all product information required for comprehensive customer information. The same editorial information, images, product features that are made available to the customer in the web shop can also be presented to the customer in the store on his mobile device. The My-Account View gives customers a comprehensive view of all their purchases, both online orders and store purchases. But even if the customer only obtains detailed information about products in the store, but is still unable to make a purchase in the store, this information is stored and can then be used for further activities. The customer can have another look at these products in the webshop, but also the retailer has the possibility to pick up these "non-purchases" and advertise them with promotions the next time the customer visits the webshop. It is now possible to map an offline browse-journey of the customer. Based on the scanned or paid products, offers or product recommendations can also be sent to the customer's mobile device directly in the store, e.g. from the SAP Hybris Recommendation Engine. Thanks to the store stocks stored in SAP Hybris Commerce, customers can also be provided with information on product variants in other colors, sizes or features. If a product is no longer available in the store, links to other stores can be given, or an order can be placed directly with delivery to your home. The security tags from rapitag replace the current fuses in areas such as fashion, electronics or beverages and are compatible with common detectors at the door. The communication between anti-theft device and smartphone runs via Bluetooth Low Energy in a Near Field mode of a few centimeters and is encrypted with 128bit. An App SDK is available to easily integrate the logic into a merchant's existing apps. Alternatively, the app can be reused in a standalone version (e.g. WeChat or as a white label). The SDK is available for iOS and Android. Product information from Product Content Management is transferred to rapitag so that product reviews, descriptions, structured product information and product reviews can be displayed as required. User authentication of the rapitag app is done via SAP Hybris Commerce, so that the user only has to register once. When paying, the Hybris Check-out and the preferred payment method stored there are accessed. After the purchase, the customer can also view his transactions via the web shop. "Non-purchases" are stored as product interests in SAP Hybris Commerce customer profile and can be evaluated with SAP Hybris Marketing for further campaigns.